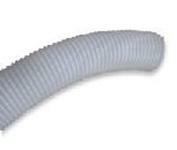 This hose has a smooth bore interior which allows more insulation to flow through. Formulated with premium grade co-polymer. Crush-proof and abrasion resistant. 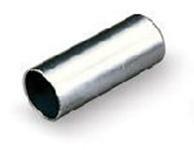 Strong and flexible and can withstand the heaviest insulation blowing schedule, because cap and channel are spirally wound together. Lightweight and see-through for easy monitoring of material flow. The Mark II hose features an especially abrasion-resistant crown and translucent ribbed walls for easy monitoring of material flow. Lightweight polyethylene hose offers the best flexibility with the added feature of having interior walls designed to achieve greatest amount of fluff to the material being blown through it. Both durable and economical for rugged all purpose performance. Mark II™ 3" x 50' Clear Hose Steel Connector - 4"